Wraith became immediately aware of Daggers’s deadly skills with his twin daggers. For nearly a minute, the two faced off taking turns striking each other with deadly precision. For every strike Wraith made against the bartender of the Wayfarer’s tavern, it was responded in kind—if not worse—by each slice Daggers made. Wielding deadly daggers in each hand, Daggers pressed on and it was all Wraith can do to keep himself from being a victim in this barfight. After helping kill the dragonborns, Salil and Lyrica moved towards Wraith hoping to aide their friend in the fight. Although considering what Wraith was up against, Salil and Lyrica weren’t sure just how helpful they would be. At the other side of the tavern, Ronak and Abyss were busy against Colrynth who turned out be a skilled fighter with his scimitar and heavy shield. Finding an opening in the fighter’s defense, Abyss drew a bloody wound across Colrynth’s chest, cutting through scale armor and muscles. Abyss knew he had struck true when he noticed that the fighter’s gaping wound continued to bleed profusely. He knew the fighter would either die a quick death or bleed out slowly. At one point during the fight, Wraith used an enchanted item to change his appearance to match Daggers’s perfectly. Although confused by this, Daggers kept up his deadly onslaught against an opponent that looked remarkably like himself. Meanwhile, Salil and Lyrica, along with Damascus tried to attack Daggers with range attacks but the bartender’s dexterity and skills allowed him to dodge and weave through the attacks. Wraith, wanting to gain an advantage in combat, briefly moved away from Daggers. The bartender took advantage of the respite and launched a flurry of deadly strikes against Salil who was standing on top of a nearby table. A well-placed deep cut to the legs and arms, and the changeling was dead before he struck the tabletop. Daggers turned to face Lyrica. “You’re next.” he said matter-of-factly. Lyrica quickly moved away from bartender and almost ran into Damascus as she tried to gain some distance from Daggers. Meanwhile, Wraith made his way quickly to the fallen changeling. He took out a potion of life and administered it to Salil who was immediately brought back from death. Within a few breaths later, Ronak and Abyss had brought down Colrynth. Ronak stayed behind, while Abyss moved to lend Wraith a helping hand. Using the shadows to quickly move, Abyss appeared next to Daggers, not as himself but in the guise of an orc. Together, Abyss and Wraith continued the battle against Daggers while the others—knowing they weren’t skilled enough to fight against the deadly bartender—kept a safe distance. At that moment, the door near the bar opened. The same young man in scale armor who had earlier delivered the cask of Amontinnado entered the tavern’s taproom. He was wielding a huge fullblade sword engulfed completely in flames. But as he entered the room, he was confused by seeing two Daggers fighting each other and an armed orc nearby. Wraith—in the guise of Daggers—quickly ordered the young fighter, hoping to fool him into helping fight against the real Daggers. The bluff worked as the young fighter tried to strike the real Daggers, who cursed the young fighter for being easily duped. Outnumbered, Daggers desperately tried to fend off his attackers while hoping to kill any one of them. But, despite Daggers’s unwavering strikes against the three opponents, he was eventually killed by Wraith. Dargen, the young fighter, was glad that the impostor posing as Daggers had been killed. Looking around the room, he saw that Daggers (Wraith) was nearby. Across the room, he also saw that one of the dragonborns had somehow managed to stay alive through the encounter. Little did he know that Salil, the chagelink, had taken on the appearance of Vrak to help further dupe the young fighter. The fighter looked towards “Daggers” who was standing behind him. Wraith’s response was quick. He stabbed the fighter through the back. Surprised by “Daggers’s” treachery, the fighter tried to attack both “Daggers” and the orc. Outnumbered and outmatched, the young fighter was quickly slain. His fullblade fell to the floor, as its flames sputtered out. Wraith still in the guise of Daggers, immediately went through the door where the young fighter had earlier emerged from. A set of stone stairs descended down to the tavern’s cellar. Torches lit the staircase and the short corridor below. Downstairs, Wraith saw two doors. Opening one, he spied a room full of casks. All were labeled as Amontinnado wines. The other room also held wine casks and supplies necessary to run a tavern. He also found a secret storage place beneath a loose stone on the floor. Inside, he found hundreds of coins, a pearl, and a sheathed shortsword which later proved to be enchanted. While the others were busy searching the bodies upstairs, Wraith broke open nearly a dozen casks, spilling their contents on the cellar floor. He then traced a line of lamp oil he had found all the way up the stairs. Back in the taproom, the others had finished searching the bodies. Their find yielded some magic items, which included Daggers’s enchanted daggers, the fiery fullblade, as well as Colrynth’s enchanted heavy shield. When Wraith came back, Damascus asked what he had found below. He explained that he had discovered over a dozen casks of Amontinnados as well as some hidden treasure. He also admitted to having broken the casks to spill their contents on the floor and that he was going to light the entire tavern on fire. Damascus asked if Wraith had spared any casks. When Wraith told him he had spared four casks, the priest of Oghma immediately asked Abyss to help him collect the valuable wine. Abyss wondered if selling the wine for profit would bring unwanted attention to themselves, but the priest seemed unconcerned about this. Outside, with treasures and casks of wine securely placed on horses, the adventurers watched as the Wayfarer Tavern went up in flames. They then discussed their next plan. They all agreed to travel to Baldur’s Gate in hopes of finding out more about the Damagers Guild. The group also needed to sell the casks as well some of the magic items they couldn’t use. When Salil was asked if he knew of a decent inn where they could comfortably stay at, Salil recommended The Purple Wyrm. It was located in the city’s wealthy Bloomridge district, known for its rich neighborhoods and popular open-air cafes. The group then rode on westward to Baldur’s Gate, spurring on their horses. They hoped to quickly cover the fifty some miles to the coastal city, even if it meant pushing the warhorses to get there. They knew if would be past sunset when they would finally arrive at Baldur’s Gate. Everyone rode in silence, keenly aware that the battle against the Damagers Guild was just about to get deadlier. Time seemingly stood still as everyone prepared for an anticipated bar fight. Around the tavern’s taproom, both sides looked at one another—each waiting to see who would start the fight. Hands slowly inched towards sheathed weapons, while lips moved in preparation of rituals that will either aid allies or hinder opponents. Both sides knew that if any one of the adventurers or tavern patrons so much as passed air loud enough to be heard, all Hells would break loose. Vrakh, the dragonborn, stood behind Ronak with his battleaxe clenched firmly in his hands. His nostrils flared as he considered his next move. He noticed the gnome and the bartender’s stern gaze, both seemingly ordering him to stand down. Vrakh took another deep breath, inhaling the pungent smell of the taproom’s filthy tables and walls. He looked towards the man seated next to him. He was dressed in full plate armor. A greataxe was securely strapped to his back. The dragonborn then turned around and sat back down to enjoy what was left of his meal and drink. For nearly an hour, the adventurers sat in the tavern asking the bartender questions about the tavern and its patrons. They also asked every one their names and introduced themselves. Ronak said his name was “Tripp”. The gnome scratched his chin and said he thought he had heard of someone named Tripp from Waterdeep before. Ronak/Tripp said he had never seen the gnome before and was certain he would never forget him if he did. The bartender said people call him “Daggers”, while the gnome with the chops and tattoos introduced himself as “Wolverine”. The fighter in scale armor and armed with a scimitar said his name was Colrynth. The dragonborns introduced themselves as Vrak, Scarrg, and Kashad. Daggers and Wolverine added that they hailed from the North, while the dragonborns claimed to have traveled from the Inner Sea area. Colrynth said he’s from Daggerford originally but currently calls Baldur’s Gate home. At some point during the discussion, Brogan (AKA Wraith) said that the gnome and the bartender’s names reminded him of a minotaur named “Bullrush” he and some others had come across in Berdusk, a city in Elturgard. Abyss added that Bullrush had been a member of an organization known as the Damagers Guild and wondered if either the gnome or the bartender had ever heard of it. Wolverine and Daggers exchanged suspicious glances but said they had never heard of Damagers Guild. Minutes later, a young human man wearing scale armor entered the taproom from a door behind the bar. The man was carrying a cask that seemed full. A look of bewilderment crossed his face when he saw the adventurers. He asked Daggers if everything was alright. Daggers nodded and asked him to leave the cask on the bar. The young man then went back to wherever he came from after leaving the cask on the bar. Some of the adventurers quickly noticed the calligraphic “A” burned into the side of the cask. Damascus whispered to the others that the mark on the cask matches the insignia of the Amontinnado family who were known to specialize in the making of some of the finest wines in Faerûn. It was said that the Amontinnado family—a wealthy family who delved in magic—had been making wines for nearly three centuries. 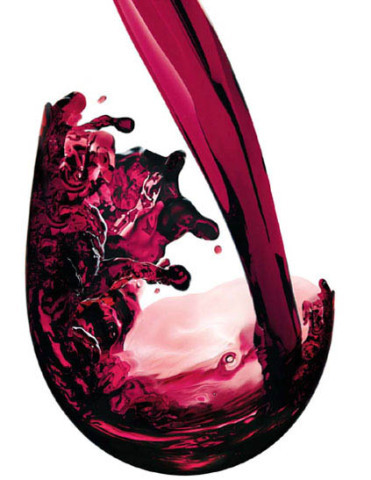 Another mark denoted that the cask contained red wine—the best kind of Amontinnado wine produced…and the most expensive. The others agreed and were aware that a cask of Amontinnado red wine could easily fetch anywhere from 1,200 to 1,500 gold pieces per cask depending on the vintage and the buyer. “That’s some fine wine you have there.” Abyss said to Daggers eyeing the cask. “Such wine seems a bit too sophisticated for a simple tavern like this if you ask me”. Daggers ignored what Abyss said as he faced the rest of the group. The adventurers said they were just about to leave anyway, so they emptied their mugs and gathered their equipment. Far enough away from tavern but still within sight, the group came up with a plan to return to the Wayfarer. They suspected the tavern of being a base of operation for the Damagers Guild so wanted to infiltrate the tavern. The plan they came up with was bold, brilliant, and unorthodox. Inside the tavern, Lyrica and Salil quickly made their way to an empty table while voicing degrading remarks about the establishment’s less-than-opulent conditions. The others made their way in and saw the taproom occupied by Colrynth, Daggers and the three dragonborns. Wolverine was nowhere to be found. Daggers, taken by surprise at the arrogance of the two strangers and their servant, tried to offer the obviously rich couple some of the Amontinnado wine. All the while, Lyrica and Salil kept up the convincing pretense of being rich—although at times a bit overplayed. The others, still invisible, had scattered themselves around the room and were worried that Lyrica and Salil’s act would be noticed for what it was, an act. At some point, Colrynth got up and walked over to the table where the dragonborns sat. He whispered something to them. The three scaly thugs then got up and proceded to walk towards the front door, while Daggers kept an eye on everyone from behind the bar. Meanwhile, Wraith, suspecting that the tavern’s occupants were planning to attack Lyrica, Salil, and Ronak, reacted first. As the party rode the elven boat towards the distant ruins, they spotted a troll emerge out the nearby woods near the river’s edge. It hurled a javelin at the group, slashing Luthan’s arm before it struck the boat’s deck. Patch quickly activated his magical boots that enabled him to walk on water. He then leaped from the boat and charged the troll. Monro took over the boat’s tiller and carefully navigated the boat closer to the river’s edge so the others can engage the troll as well. When the boat was close enough to shore, Fredara and Jobek both leaped out and joined Patch in battle. Surprisingly, the troll proved formidable. Patch knew enough about trolls but considered the medium-size troll to be an easy kill. The troll proved otherwise. Unable to hurl its javelins, the troll unsheathed its massive greatsword and began slashing at the three combatants. 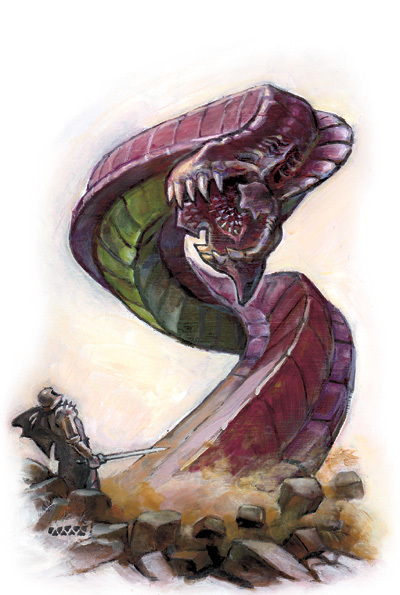 With each deadly strike the three adventurers imposed upon the fearsome troll, it regenerated its wounds and retaliated by sweeping its massive blade in a deadly arc that threatened to cut limbs or slay outright. For several rounds, the battle raged on with each side desperately trying to quickly end the deadly encounter. Meanwhile, the others on the boat launched range attacks hoping to help their comrades against the troll but the range and chaos of battle made it difficult to get an accurate shot on the troll. To make matters worse, Monro spotted three green skinned humanoids swimming downriver towards the boat. He quickly warned the others that more trolls may be coming. Upon hearing this, Patch disengaged his battle with the troll. He ran back into the river to intercept the other creatures, leaving Jobek and Fredara to deal with the bloodied troll. As the three creatures swam towards Patch who was standing in the middle of the river atop the water, Monro hurled a spell at them striking fear upon their hearts, increasing their chances of missing their target. Vyn and Luthan aided by launching their own range attacks from the boat. As the closest one reached Patch, he quickly realized the three creatures were Sahaguins—albeit of the freshwater kind. Ignoring that strange fact, Patch engaged the sahaguins in battle while the others attacked from range. In time, the battle against the troll and the sahuagins was won. Patch beheaded the troll. After, he and the others lifted the headless troll’s body upon the boat’s deck so they can inspect its gear while continuing their journey downriver. The sahuagins’ lifeless bodies were quickly carried away by river’s current. After several minutes, they realized that the troll’s gear were not magical in nature. They then dumped the lifeless troll’s body into the river. Catching their breaths and healing themselves, the group continued their journey downriver towards the distant ruins. With Arrol leading Huntrah and Cain through the mountain pass, they made good time as the three adventurers made their way towards the mines of Bellanan. Just past highsun, the trio came upon a small dale. A small, shallow stream made its way through the dale. Momentarily stopping for Arrol to get his bearings, the group spotted harpies flying overhead. Just behind a copse of trees on the other side of the trees, they also spotted two cyclopses. Each wielded long glaives capable of slicing a tree—and a man—in half. Arrol noted that the monsters must be a patrol under the Winter Witch’s command. “Maybe they aren’t aware that Koliada is dead,” Arrol said. A battle ensued in which the adventurers quickly killed all four monsters. Not one of the three skilled adventurers was hurt during the encounter. The group then took a short break while Arrol searched the area. Within a few minutes, the Ranger found tracks that led from the direction of the mines. The group arrived at the mines and found it surprisingly deserted of guards. Tools littered the ground in front of the three mine entrances. A nearby stone shack was also unoccupied. The area was quiet, save for the sound of a soft breeze that rustled the leaves of several trees nearby. “Maybe they’re inside.” Arrol added. Cain pointed to two very tall pine trees nearby. “Or maybe,” Cain whispered to the other two. “she does have guards.” All three looked and quickly noticed that despite the wind blowing through the area from one direction, the leaves of the two nearby pine trees rustled in a different direction, moving against the wind. The nearest of the two great trees altered its shape. 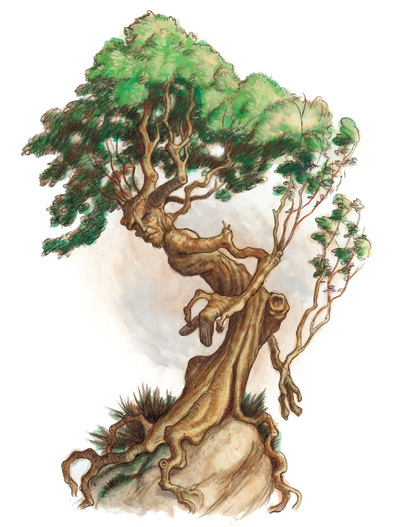 Branches merged to form arms and legs, while a face formed upon its wide trunk; deep knots becoming eyes and a mouth. The other nearby tree also transformed itself into a tree-folk. “I am Mosslock.” the nearest treant said, speaking in the Elvish tongue. “And I am Hollywood.” the other—a thinner specimen—quickly added in a flamboyant fashion. It seemed to relish attention and didn’t want to be left out of the conversation. The three adventurers then began a conversation with the two treants. Speaking in Elven, Arrol led the conversation and persuaded the treants to go back to their forest—or wherever they’re from. He explained that the Winter Witch had been defeated by he and his fellow adventurers. When asked for proof, Huntrah showed Mosslock and Hollywood the Sword of Black Ice, a longsword once wielded by Koliada herself. Cain also presented the Ice Crown and the Scepter of Ice, items that once belonged to the Winter King. Upon seeing the sword, crown, and scepter, the two treants were convinced. They said they were both from the Far Hills and would return there. The adventurers bid them farewell. Arrol added that perhaps their paths would someday cross again. The two treants then left and began their long walk down the mountain towards the Far Hills. With the treants gone, the three adventurers proceeded to enter the mines; but before they could, a cyclops trailing three dwarves emerged from the mine entrance. 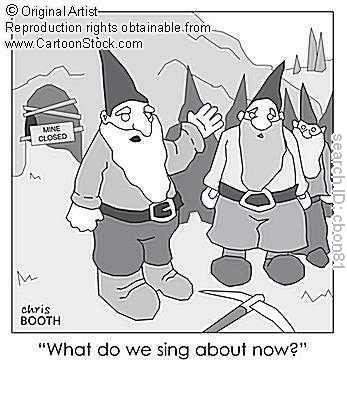 The three dwarves carried digging tools and looked haggard. When the cyclops spotted the adventurers, he raised his glaive to them and uttered a challenge in common. Rather than engage the cyclops outright, Arrol decided to convince the one-eyed monster to leave the mines along with the other cyclopses. Unsure of what to do, the cyclops ordered a dwarf to go back into the mines to get the others. Moments later, four more cyclopses arrived. One cyclops in particular wore leather armor and held a long intricately carved wooden staff. It had long braided hair and tattoos on its face and arms. The cyclops introduced himself as the leader and a shaman among his people. Arrol, again tried to convince them to leave the dwarves and the mines or face the consequences. He went on to explain that the treants had already left. To further help convince the shaman and the others, Arrol pointed to the sword of black ice Huntrah wielded. He also pointed to the ice scepter and crown Cain held before them. The shaman thought about their offer for a moment and added that they were given a chest of gold as payment by the Winter Witch and Winter King. The chest was being guarded by two other cyclopses in the mines who were also watching over the dwarves. The shaman demanded that they be allowed to take their money, promising to leave peacefully if allowed to do so. Huntrah then took out an astral diamond and threw it at the foot of a nearby cyclops. He said the astral diamond should more than suffice to ensure they left immediately and without harming a dwarf. Huntrah threatened to kill them all and take what little treasure they had if they were to renege on their word. Satisfied, the shaman ordered the other cyclopses to leave the mines and the dwarves. As Arrol, Cain, and Huntrah watched the cyclopses leave the mines, nearly a hundred dwarves—all weary from their ordeal—slowly emerged from the mines. Each one personally thanked their unlikely rescuers: an elf, a drow, and a lich. Thankful that they had avoided unnecessary bloodshed, the rescuers led the dwarves back to Hammerfist Hall. Zaachaeus kept up his attacks against the white dragon, Thrymzen, his blades cutting deeply with each strike. Thrymzen tried to dodge and avoid the drow’s deadly onslaught, but he knew it was just a matter of time before his few centuries of existence would come to a bitter end. As if to drive home the point, Thrymzen noticed another attacker—farther down the hall—take careful aim at him with a bow. A sudden sharp pain in Thrymzen’s chest seconds later confirmed that his life had indeed come to an end. He always thought that he would surpass his sire, Kurikveaeri—an ancient white dragon—in strength, power, and wealth. But as he lay dying on the floor, an arrow buried deep within his massive heart, Thrymzen could only ask himself one question: where did it all go wrong? As the dragon lay still, Zaachaeus looked back at Arrol the Ranger and nodded before turning his attention to the battle still being waged in the icy chamber. His father, Huntrah, was trying to fend off attacks from both the ice troll and Koliada, the Winter Witch, while making attacks of his own. Meanwhile, Cain—hovering near the ceiling—launched his deadly spells. The Winter King stood near the dead dragon, a look of disbelief spread across his undead visage. Badly wounded himself, the Winter King looked back to his mistress, Koliada, as if to reassure himself that the tide of battle could still sway in their favor. The battle that continued in the ice-covered throne room was long and bloody. The heroes hurled powerful spells and struck with deadly blows with steeled weapons against the Winter King, ice troll, and Koliada—the Winter Witch. The fight nearly cost Dred his life and had severely wounded mighty Huntrah. Even Omega, the gnomish archmage, didn’t escape the battle unharmed. In time, both the troll and the Winter King was slain. Koliada, herself badly wounded from the battle, tried to flee and save herself, but the adventurers would not have it. Before she could escape, the adventurers had slain her by using the Sun’s Sliver a sliver of pure sunlight and the only known object in the universe that truly destroy the Winter Witch. The group recently found the Sun’s Sliver at the temple to Lathander in the Sunset Mountains. With the Winter Witch dead, the adventurers healed themselves. They then explored the rest of Hammerfist Hall and found hundreds of dwarves frozen in ice. But with Koliada’s death, the ice began to melt and soon every dwarf in Hammerfist Hall was free from his or her icy prison. 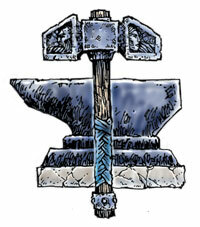 Amongst the dwarves freed from Koliada’s powerful curse was the lord of Hammerfist Hall, Clan Lord Farsten Hammerfist. Grateful for his and his clan’s freedom, Clan Lord Hammerfist insisted that the adventurers stay for a while so they may properly reward and honor their saviors with a feast held in their honor as well as rewarding them with 10,000 gold pieces. A funeral was also planned for Orain Lightoath, beloved cleric of Moradin. The heroes agreed, thankful for the generous hospitality and equally generous reward. More important, they were thankful for having possibly gained an alliance with the dwarves of Hammerfist Hall. The adventurers worked their way deeper into Hammerfist Hall and came upon several dwarven zombies. Meanwhile, three wraiths—once dwarves in life—oozed out of the floor behind the group, their haunting and deep voices carrying throughout the halls. Just beyond the zombies, two dwarven skeletons enveloped in bright orange flames, stood guard before a large set of double doors. Both Huntrah and Zaachaeus waded through the throng of walking corpses, cutting their way towards the doors and the blazing skeletons, while Dred launched deadly arrows down the hall striking any undead unfortunate enough to get in the way. Meanwhile, Arrol, Cain, and Omega battled the wraiths, quickly destroying them before any wraith could reach the adventurers. As the zombies fell to Zaachaeus and Huntrah’s deadly blades, the blazing skeletons launched flame orbs at the two fighters. Easily dodging the fiery orbs, the two made quick work of the two blazing skeletons. With every undead destroyed, Huntrah, Cain, and Dred remained while the others explored the rest of Hammerfist Hall, opening doors they came upon using the set of keys they found on the barbarian. Just beyond a set of double doors, Omega found yet another set of double doors. The symbol of Moradin was emblazoned upon the doors. Thick, solid ice entirely covered the doors. With a powerful fiery spell, Omega melted the ice surrounding the doors. 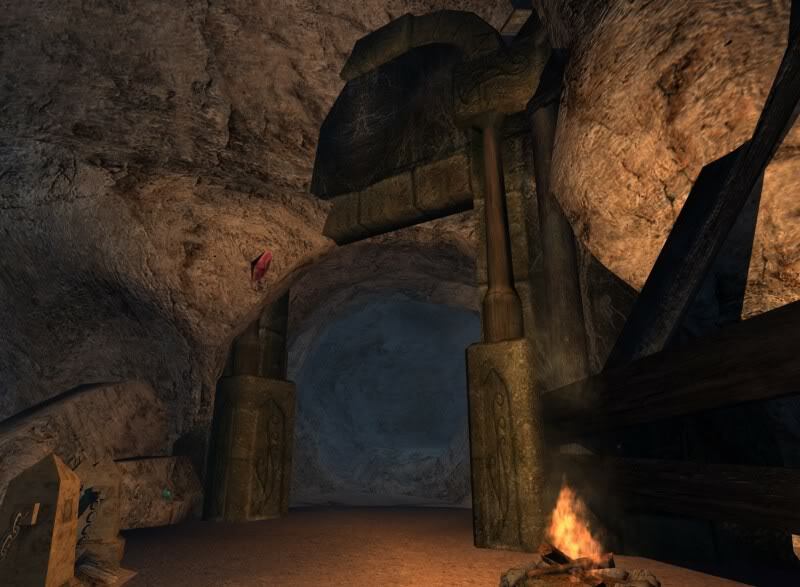 Opening the doors, Omega, along with Arrol and Zaachaeus entered what they guessed was the temple of Moradin. Inside, they saw a frozen dwarf encased in ice kneeling before an altar. The chamber’s walls, floor, and ceiling were coated in solid ice making moving through the chamber difficult at best. Upon reaching the frozen dwarf, they recognized Orain Lightoath, the same ghostly dwarf they encountered outside. Not wanting to use a fiery spell inside the temple, the adventurers made their way back out to explore the rest of the dwarven stronghold. Looking at the fallen corpses of dwarves filling the hallway, Dred knelt besides each one and carefully recited Moradin’s Last Rites to each kinsdwarf. With each completed blessing, tears flowed from Dred’s eyes as he saw the spirits of his comrades rise from their mortal shell, bid him thanks and fade away before his tearful eyes. Meanwhile, Huntrah’s attention was quickly captured by a deafening crash against the inside of the double doors he stood in front of. Within moments, Huntrah, Cain and Dred noticed cracks begin to appear on the two massive doors. A quick second later and the doors exploded outward in a shower of ice and splintered wood. As the air cleared, the three beheld a large white dragon standing just inside the massive doorframe. Although far smaller, the dragon before Huntrah looked identical in appearance to Kurikveaeri, the ancient white dragon he and the others had recently slain near an abandoned temple to the sun god, Lathander, high atop the northern Sunset Mountains. The dragon stretched its maw wide open and breathed a freezing blast down the length of the hallway. Huntrah managed to duck into a side niche and avoid the freezing blast. The drow fighter then rushed the dragon striking it several times, while Cain and Dred attacked it with range attacks. When the dragon seemed near death, Huntrah used his Blink Ring and teleported behind the dragon to see what lay behind the white dragon. He knew that Cain with the help of Dred, the dwarf, would finish off the wounded dragon easily enough. Huntrah blinked inside a huge and freezing cold chamber with high ceilings dripping with icicles like stalactites. Massive ice chandeliers illuminated the room with heatless blue flames from hundreds of unmelting ice candles. On a dais at one end of the icy chamber stood a high-backed throne, it’s seat covered in thick furs. A figure, once a human man but now resembling nothing more than an undead version of himself, stood near the throne. He held a scepter made entirely of ice and wore a crown made of ice. Nearby, a large ice troll stood next to a woman of exquisite snow-white skin and raven tresses. She was wielding a longsword carved entirely of black ice. Much to Huntrah’s surprise, it seemed that the undead man—whom he suspected was the Winter King—was engaged in battle against the woman and the troll! Taking advantage of the situation, Huntrah rushed to engage them all! To the aged fighter, it didn’t matter who was fighting whom. He swore under his breath that before long, undead, woman and troll would feel the wrath of his deadly blades. As Huntrah rushed the woman and attacked her, the Winter King made his way to stand next to the injured dragon. 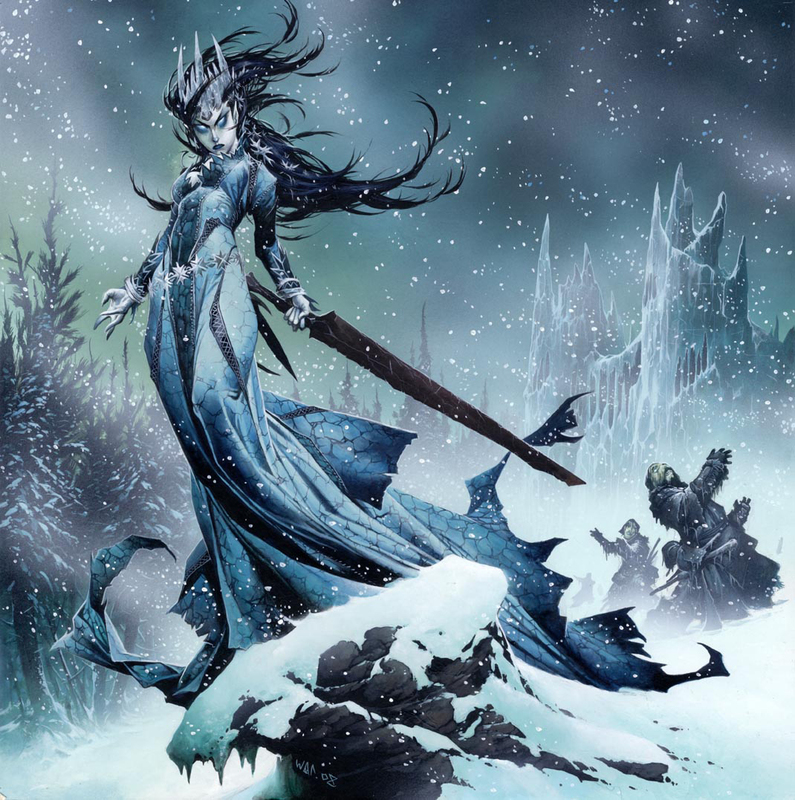 Meanwhile, the ice troll stood next to the woman and fought against Huntrah, clawing at the drow. Moments later, Cain appeared through a magical portal. A spell he casted earlier allowed him to fly and hover above the battle in the throne room. “For now, we have an alliance,” Koliada replied in an icy tone. “but know that you will pay for your betrayal.” The Winter Witch then turned her full attention to Huntrah whose attack she barely managed to avoid. And so the battle in the icy throne room continued with renewed ferocity. Koliada—much to Huntrah’s surprise—struck him with her sword of black ice, stunning him as it struck. Back in the corridor, Zaachaeus, Arrol, and Omega arrived in time to see the battle in progress. Zaachaeus rushed the white dragon recognizing it as being related to Kurikveaeri, whom he had helped slay as well. The white wyrm turned its attention to the younger drow standing defiantly before him. Pure rage coursed through his cold being. Darkness has settled in the pass. As your group makes its way up towards Hammerfist Hall, you spot a figure standing near an outcropping of rocks. At first, you thought your eyes were playing tricks on you. But you soon realize that the figure is a dwarf, dressed in chain mail standing upon a patch of snow. His long beard is well kept while his face suggests he’s a dwarf well past his prime. Your darkvision shows a golden holy symbol of Moradin, a hammer before an anvil, hanging from his neck. You also notice that despite the moon casting shadows in the area, the dwarf’s figure is not casting a shadow upon the rock behind him. As a matter of fact, you are able to see through him! Before you can react, the dwarf raises his hand in greeting. He takes a few steps towards your group leaving no traces upon the soft snow. With that final blessing, Orain Lightfoot vanishes following a light, bone-chilling breeze that sweeps through the pass. 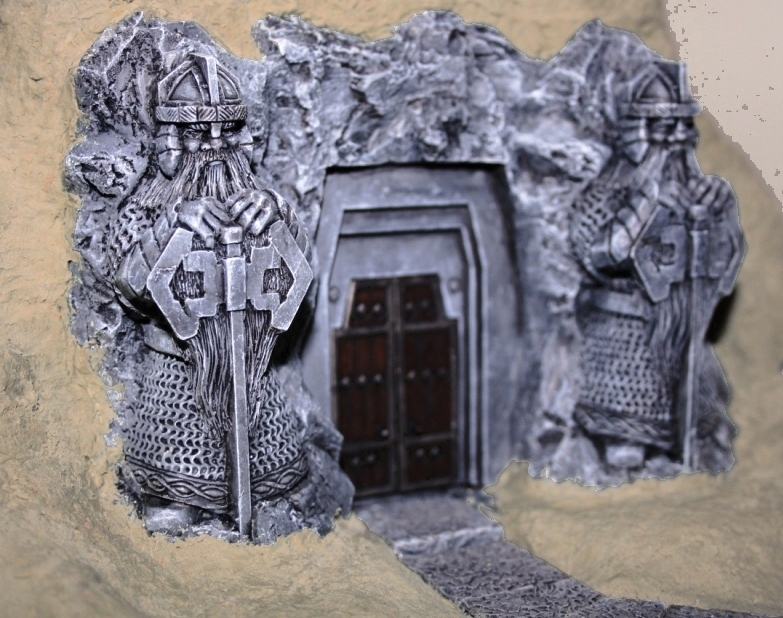 Upon arriving at Hammerfist Hall, the adventurers hid nearby and spotted four humans guarding the front entrance to the dwarven stronghold. Dressed in thick furs which partially covered their chainmail, each man was armed with a halberd and a crossbow. But, rather than openly attack the guards and fight their way in, the group decided to risk passing themselves off as evil adventurers for hire. The group approached the guards who trained their weapons upon them. Zaachaeus asked for an audience with the Winter King demanding that his and his fellow adventurers’ business was with the Winter King only. Unsure of how to respond to the group, the other guards waited while one guard went inside Hammerfist Hall. Moments later, the guard returned with a very tall barbarian-looking man wearing thick hides and armed with a war pick. The barbarian faced the adventurers and introduced himself as Borrtek and demanded the group tell him what they wanted with the Winter King. The adventurers demanded that they be given audience with the Winter King immediately. They added that the Winter King could benefit if he were to hire them to join his ranks. Trying to be as intimidating as they could, the group admitted that they had destroyed the undead dwarves that stood watch in Wolf Bulwark. Furious, Borrtek asked why he shouldn’t simply slay the adventurers for what they had done. They then convinced him that their show of strength and skills with spells and blades was all the more reason the Winter King should hire them. Seemingly impressed by their courage—or foolhardiness—Borrtek bid them to follow him into the stronghold. He added that they had arrived in time, since a meal had just been prepared for him and the guards. He said the guards could wait to eat their meal after the group had finished. Passing through a tunnel from the main entrance, the group was soon led into a chamber that served as the stronghold’s reception room. As they entered the chamber, the group was welcomed by the scents of rich food and wood smoke. Smells of roast goose, suckling pig, apple tarts, and other fine foods lingered in the air. The room glittered with candlelight around a table laden with plates of food and golden goblets filled with wine and mead. The chamber was occupied by a demure young woman standing by the table. Two large hunting dogs lie lazily near the woman’s feet. They also saw three wooden doors—seemingly locked—leading farther into the stronghold. Everyone sat down on one side of the immense food-laden table, but despite Borrtek’s insistence and the woman coming around to serve each of them with goblets of honeyed mead, the group refused to partake of the offered food and drinks. Instead, the group continued to insist that they meet the Winter King. Borrtek had the woman send a guard behind one of the lock doors to let the Winter King know that the adventurers wanted to meet with him in hopes of working for him. Later, the guard returned and passed on a response to the woman, who in turn, whispered the message to Borrtek. Borrtek said that the Winter King did not want to be bothered and that he can speak on the Winter King’s behalf. At one point, Borrtek asked that although it’s clear the group may be evil judging by the two drows and the lich in their midst, he questioned what Dred—a dwarf—was doing with them. They lied about Dred being part of the group for years. The group again insisted on meeting the Winter King which almost led to a confrontation with the barbarian. A fight was avoided when the group reluctantly gave in when Borrtek suggested the group try and meet with the Winter King in the morning. Meanwhile, he offered for them to spend the night in a nearby sleeping chamber. Again, the group declined the barbarian’s offer of hospitality and said they had a magical place they rested for the night. After an hour in which the group shared tales of their evil exploits with the barbarian, the adventurers were led back outside where they opened a doorway into a magical mansion they often used to rest. Inside, the group discussed plans on how to free Hammerfist Hall before turning in for the night. The next morning, the group noticed that the guards they saw the night before had been replaced with new ones. Besides four human guards, four tieflings wearing thick winter fur coats that hid any weapons or armor was standing watch before the stronghold’s main entrance. The adventurers told the guards they were to meet with the Winter King this morning. A guard went to get Borrtek. He arrived and stood inside the front entrance and told the group that the Winter King had hired them and would pay each of them 5 gold coins per day and shares of treasure later. He gave them their first task: to go back to Wolf Bulwark and guard the pass. Since the group destroyed the undead there, the Winter King thought it a fitting job for them. Borrtek closed the front entrance and went back inside leaving the adventurers and the guards alone. The group waited a while longer thinking Borrtek was going to return to bring them before the Winter King as discussed the night before. The group tried asking the guards if their pay of 5 gold coins per day was similar to their pay. The guards would not speak to them. One of the guards, an old man, said the group may as well head to Wolf Bulwark to their posts. Food and water would be brought to them later that day, he said. The adventurers then said that the Winter King didn’t pay well enough and that they decided to quit rather than work for a measly sum. The old man then bid them leave the pass and go on with their business. That’s when all Nine Hells broke loose. The adventurers attacked the guards and made short work of them. Within moments all the guards lay dead on the snow-covered ground. Only the old man was spared death. Since he was somewhat cordial to the group, Zaachaeus knocked him out with the flat of his blade. Huntrah approached the door and bid Omega to open it with a spell. Omega did better. He opened a magical portal that allowed them all to bypass the tunnel completely! Stepping through the portal, Omega appeared inside the chamber where Borrtek, a female gnome, and two large dire wolves were busy eating their morningfeast. As the rest of the adventurers were stepping through the portal, Omega unleashed a powerful spell that stunned all of the chamber’s occupants. Unable to react, the rest of the adventurers entered the chamber and quickly slayed everyone. After searching Borrtek and the woman, they found among other things, a set of keys. They used the keys to open the doors leading back outside knowing a lone guard was in the tunnel. After opening the doors, Omega spotted the guard running full speed away from the stronghold. Apparently, the guard had heard the combat and decided to escape. Omega unleashed a spell upon the guard as he ran past the fallen sentries outside. Dred noticed the guard hadn’t been killed by Omega’s spell and considered shooting an arrow at the fleeing man. Omega bid him to stay his bow and watch. As the guard kept on running, he suddenly began to feel that something was wrong. Although he felt a wave of magic strike him from behind as he ran, he thanked Tymora for his luck at surviving the attack. But a few more steps and he quickly realized the goddess of luck may not have granted him her blessings after all. A sharp, biting pain swelled from deep within his bowels and increased with every stride. Pain, unlike anything he had ever felt before coursed quickly through his body. He felt blood flow out of his nose, mouth, and from every orifice on his body. Suddenly—and to the guard, mercifully—he felt his innards explode. He was dead before he struck the white, snow-covered ground. Back inside, Huntrah opened the door the female servant used to speak to a guard the night before. Behind the door, Huntrah and the others noticed a long torch-lit corridor wide enough for two to walk side by side. Several wooden doors, all with built-in locks on them led into the corridor. Near the end of the long hallway, they noticed a set of stairs leading up to the left. The group decided to investigate the first set of doors to the right. Carved upon the ancient doors were the words “Do not open on pain of death by order of the Winter King”. Using the set of keys, they quickly gained entrance to what lay beyond the doors. Inside, they noticed a large chamber. A circle of runes was engraved upon the stone floor. It glowed with reddish light. Omega and Cain examined the runes and determined that it was a teleportation circle. Judging by the runes and how long ago it had been carved into the floor, they both determined that it was as old as Hammerfist Hall. They also discovered that the teleportation circle was still functional, but it only worked as a destination and not as a starting point. 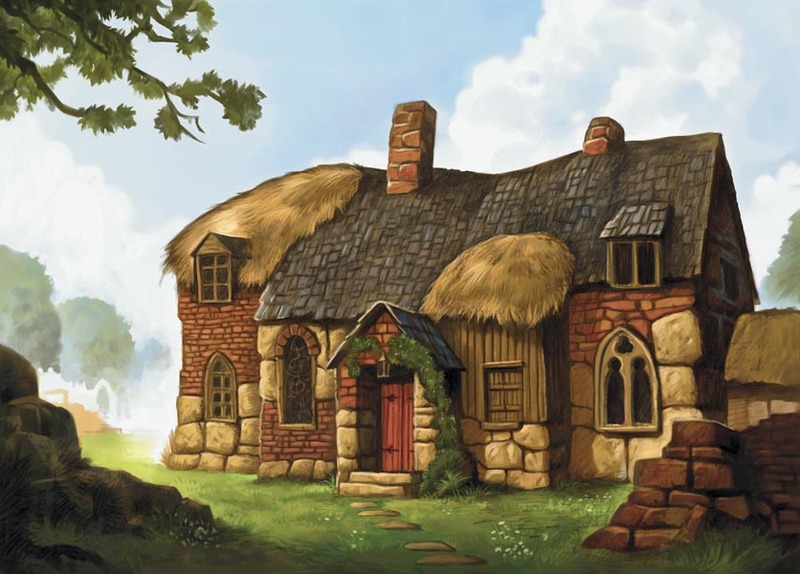 When they asked Dred what he knew about the circle, he admitted that he knew little save that a similar smaller circle existed in a chamber inside the outpost in Thonor’s Pass. He recalled his mentor, Killar Rockstrider, mentioned how messengers could be sent through the portal to quickly send word back to Hammerfist Hall if the outpost was attacked. Deciding to leave the circle alone for the moment, the adventurers left the chamber. Once back out in the corridor, the group spotted a patrol of guards similar to the ones outside. The patrol came down the stairs at the end of the long corridor, weapons drawn. But before the guards could even reach them, the group wiped them all out with their range attacks. Having easily dispatched the patrol, the adventurers quickly made their way to the stairs vowing to continue their mission of freeing Hammerfist Hall from its vile host, the Winter King. A group of seasoned adventurers made a journey up to the Sunset Mountains to make contact with the Hammerfist Dwarves of the Northern Sunset Mountains and to assault the Zhentarim fortress of Darkhold. Taking a teleportation circle from a tower near the Reaching Woods, the group arrived at Kilgirn Hold. Kilgirn Hold, meaning “proud mountain-hold” in dwarven, was occupied by a force of soldiers from the town of Bear’s Head. Led by the wood elf ranger, Arrol Mai-fair, the group made their way down the mountain pass of Valdinn. Arrol had recently scouted the region mountain pass and had discovered signs of two cyclopses and at least one harpy wandering in the area. Strangely enough, he didn’t see any signs of dwarves having been in the area recently. He also noted that cyclopses and harpies were fey creatures and not normally found in mountain regions. The band of fey creatures seemed to have wandered into the area then made their way back down the pass. The group left Kirgin Hold dressed for winter and protected by a ritual against the cold weather. Despite it being the end of summer, winter didn’t seem to have given up its hold on the Sunset Mountains. The group wondered if the unusual winter season had anything to do with what happened in the Sunset Vale months ago? They recall vividly how winter suddenly and explicably came upon the Vale at the beginning of summer just these past few months. They learned that the harsh weather was brought upon by a being calling herself the Winter Witch. They tried to put a stop to the Winter Witch, even slaying the ancient white dragon Kurikveaeri near an ancient monastery dedicated to Lathander, the sun god. Despite not confronting the Winter Witch, the magical winter quickly released its hold upon the Vale. Everyone breathed a sigh of relief and thought the whole ordeal had ended. But now, the group wasn’t so sure. Patches of snow on the ground and the cold, biting temperature told the group that the Winter Witch’s icy grip still lingered. A few miles down the mountain pass, the group spotted a young dwarf running at full speed towards them. By the looks of it, the dwarf was running for his life. A moment later, they saw a large rock strike a tree just behind the dwarf. The dwarf, not slowing down at all, kept on running. Immediately after, the adventurers spotted three harpies wearing fur vests land on nearby boulders then take to flight upon the group’s arrival. A battle ensued in which the group fought off three harpies and two cyclopses. Arrol approached Dred and reassured the dwarf of his safety, before taking deadly shots of his own at the encroaching harpies. The group fought with tenacity and skills that surprised the young dwarf. Not knowing yet whether the strangers were friend or foe, Dred Ironfoot, lent his skills by placing well aimed shots at a distant cyclops who was busy fighting off one of the adventurers who had stepped through a magical doorway a moment before. The harpies tried to hurt the group by singing songs of rage but the adventurers made short-work of them. 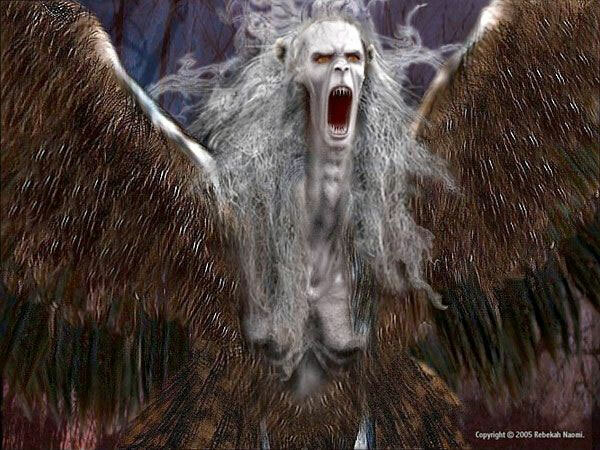 Even flying above the group didn’t offer the harpies any protection from the group’s powerful spells and deadly range attacks. The dwarf saw first-hand the group’s skill when he witnessed one of the adventurers, seemingly a fighter, sever a leg off the remaining cyclops with a well-placed strike with his blade. The cyclops fell, thrashed about for a quick breath and bled to death soon after. With the battle won, Arrol approached Dred once more and introduced himself and the rest of the adventurers to the dwarf. Dred found himself in the midst of two drows, a gnome, a human, and a lich. Fearful at the sight of these strange people, the hunter dwarf was put at ease when the adventurers assured him of their good nature. When asked who he was and where he was from, he explained that he was part of a detachment of mountain scouts assigned to guard Thonor’s Pass to the south. The pass defended the Northern Sunset Mountains from any incursions coming up from the Far Hills. Unfortunately, Thonor’s pass had been overrun some time ago by several Frostblight Treants led by a gargantuan white dragon. He recall seeing the death of his fellow hunters, especially his mentor Killar Rockstrider, who saved him from certain death when Killar pushed him off of a short cliff just as the dragon struck Killar with its icy breath. Despite his serious injuries sustained from the fall, Dred survived. The hunter went on to share how he had recovered and spent the last two months trying to find any sign of survivors. He managed to survive off of the land and luckily avoided creatures and wandering monsters; that is, until he chanced upon the harpies and the cyclopses. Dred added that at one point, he came upon two adventurers who hailed from Cormyr some time during the past tenday. The two were headed back down the mountain after their group’s priest, mage, and warlord were killed by forces loyal to what they said was the Winter Witch’s consort, a being they referred to as the Winter King. Apparently, the Winter King—a powerful undead human—may have turned upon the Winter Witch and claimed her forces as his own. He said that the two from Cormyr shared that they had ran into a band of elven rogues from Evereska who had unsuccessfully tried to infiltrate Darkhold’s inner halls. More disturbing was how they explained that the evil bastion, which once belonged to the Zhentarim Network, was now occupied by undead forces led by an undead eladrin. They overheard eladrin guards in Darkhold speak of the Winter King as though they were allied with him. They warned Dred that the Zhentarims who used to occupy Darkhold have all been turned into undead soldiers. When asked if Dred would lead the adventurers to the dwarven halls of Hammerfist, he agreed. 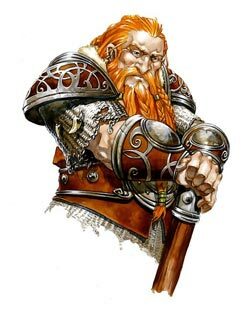 The group decided that it would be best to confront the Winter King and hopefully find surviving dwarves and even their Clan Lord, Farsten Hammerfist—a direct descendant of Dorrak Hammerfist, founder of Hammerfist Halls. Huntrah also suggested that perhaps the dwarves of Hammerfist can help them in their planned assault of Darkhold. 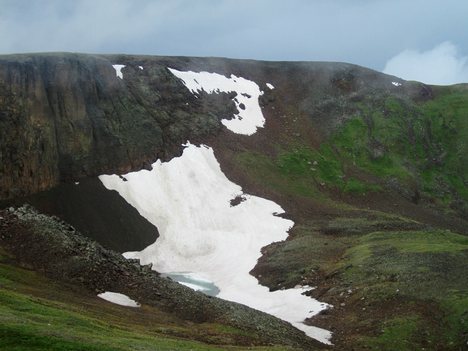 After nearly nine miles of trekking through the mountain range, the group arrived at Wolf Bulwark. Stone huts that once housed dwarves assigned to protect the path leading up to Hammerfist Halls some two miles distant were now occupied by over a dozen undead soldiers comprised of skeletons and zombies. To Dred’s horror, the skeletons and zombies were all once living dwarves. In death, their journey to Moradin’s glorious halls was denied them. Instead, they were forced to serve as undead guards for the Winter King. The group, vowing to free the dwarves’ tormented spirits from the clutches of the Winter King, attacked in force. Omega opened the attack with a volley of lighting that arced from one undead to the other. In a matter of seconds, Omega had all but destroyed all of the undead guardians with his mighty spell. The others joined in the fray and quickly freed Wolf Bulwark of its undead hosts. After the encounter, the group took the time to honor the dwarves’ remains by piling them upon a large stack of wood then set the makeshift funeral pyre ablaze. With nightfall quickly approaching, the group made its way to Hammerfist Halls intent on freeing the dwarven stronghold from the evil Winter King’s control.